Bill Clinton, John Major, Boris Yeltsin and Leonid Kuchma – the then-rulers of the USA, UK, Russia and Ukraine - agreed to the The Budapest Memorandum as part of the denuclearization of former Soviet republics after the dissolution of the Soviet Union. Putin installed 150,000 troops along Ukraine's borders after the overthrow of Moscow ally Viktor Yanukovych by pro-European protesters. On Friday, as pro-Russia gunmen patrolled Crimean streets in armored vehicles and took over airports there, President Obama delivered a blunt warnings to Moscow. World's largest aircraft unveiled and hailed 'game changer' The world's longest aircraft, consisting of part airship, part helicopter and part plane, has been unveiled and could be the key to greener more efficient planes in future as developers predict one day there could be as many of the hybrids as there are helicopters todayThe HAV Hybrid Aircraft ... There is much more. It is designed to stay aloft for three weeks and carry tons of cargo. While the say it could also be used for surveillance, I think it would be noticed. Ukraine official: Russian troops have launched an 'armed invasion' of Crimea The report appears to confirm my speculation on the reason the Russians took over the two airports to facilitate the invasion. the attacks keep coming and they have driven up the negatives of the group, but it has not stemmed their determination to stop the growth of government and to fight back against the evils of liberalism. Osaka Gas Co. (9532) and Chubu Electric Power Co. (9502), utilities serving central and western Japan, will invest $600 million each for half the equity of the first unit of a U.S. liquefied natural gas plant. The companies will each get 25 percent in Train 1 of a plant in southeast Texas operated by Houston, Texas-based Freeport LNG Development LP, the Japanese utilities said in a joint statement today. The LNG plant’s first unit will produce about 4.4 million metric tons a year and is scheduled to begin operating in 2018, according to the statement. The investment, which will be finalized in the second half of the year after the project wins a construction permit, follows a 20-year supply contract Freeport signed with the Japanese firms in 2012. Converting gas into liquid was scheduled to begin in 2017, the partners said at the time. A top Ukrainian security official says two airports in Crimea are under Ukrainian control despite attempts by gunmen to “seize” them. But Ukraine’s Security Council Chief Andriy Parubiy insisted later Friday that the airports were still under Ukrainian control, according to the Interfax news agency. Ukraine’s State Border Guard Service said about 30 Russian paratroopers from the 810th brigade of Russia’s Black Sea Fleet had taken up position outside the Ukrainian Coast Guard base in the Sevastopol area. It said the paratroopers said they were there to prevent any weapons at the base from being seized by extremists. Why not punish those who threatened racial violence? Officials at a Northern California high school acted appropriately when they ordered students wearing American flag T-shirts to turn the garments inside out during the Mexican independence celebration Cinco de Mayo, a federal appeals court ruled Thursday. The 9th U.S. Circuit Court of Appeals said the officials’ concerns of racial violence outweighed students’ freedom of expression rights. Administrators feared the American-flag shirts would enflame the passions of Latino students celebrating the Mexican holiday. Live Oak High School, in the San Jose suburb of Morgan Hill, had a history of problems between white and Latino students on that day. The unanimous three-judge panel said past problems gave school officials sufficient and justifiable reasons for their actions. The court said schools have wide latitude in curbing certain civil rights to ensure campus safety. The IRS’s new proposal to crack down on nonprofits was in the works a year before the tea party targeting scandal broke, according to a Treasury Department official who told congressional investigators it was spurred by pressure from outside parties. The revelation follows earlier testimony from former IRS Commissioner Steve Miller, who told investigators that they started “brainstorming” ways to crack down on nonprofits while under pressure from a senior Democratic senator who was “complaining bitterly to us” about the way groups were engaging in politics while organized as social welfare nonprofits. House Oversight Committee Chairman Darrell Issa and subcommittee Chairman Jim Jordan recounted the testimony in a letter sent this week to IRS Commissioner John Koskinen, who now must decide what to do about the proposed crackdown. Outrage Over Sexist Remarks Turns Into a Political Fund-Raising Tool Stephen Crowley/The New York Times Donations flowed in for Senator Claire McCaskill after Todd Akin compared her to a dog playing “fetch” in Washington. With a record number of women in Congress and dozens more on the ballot, attacks on figures like Wendy Davis, Claire McCaskill and Hillary Rodham Clinton can instantly generate contributions. The party of perpetual outrage knows how to gen up an excuse to raise money over perceived criticism of the policies of its women candidates, but has no trouble with similar remarks aimed at conservative women. That double standard suggest it is opportunism and an attempt to silence criticism at work. The left just can't seem to handle it. 'Obamacrats' threaten America's energy boom with Endangered Species Act The act needs to be repealed as an anti Darwin, anti science vehicle for obstructing development of US resources in favor of critters of dubious value. As freezing weather drained stockpiles of propane to their lowest seasonal level in two decades on the U.S. East Coast this month, shivering New Englanders couldn’t tap abundant supplies sailing out of Texas. They had to look 4,000 miles away to more-expensive heating fuel from Europe. The reason? The Jones Act, a 94-year-old law that prohibits non-U.S. ships from transporting cargoes between the country’s ports. With pipelines full and not a single eligible propane tanker to deliver fuel from Houston to states such as New York, consumers have had to pay more than $100 a metric ton extra for propane from across the Atlantic. Few presidents understand the power of speech better than Barack Obama, and even fewer the power of denying it to others. That's the context for understanding the White House's unprecedented co-option of the Internal Revenue Service to implement a political campaign to shut up its critics and its opponents. Perhaps the biggest fiction of this past year was that the IRS's targeting of conservative groups has been confronted, addressed and fixed. The opposite is true. The White House has used the scandal as an excuse to expand and formalize the abuse. About a month after the IRS inspector general released his bombshell report about IRS targeting of conservative groups last May, Acting IRS Commissioner Danny Werfel unveiled a "plan of action" for correcting the mess. One highlight was that targeted groups would be offered a new optional "expedited" process for getting 501(c)(4) status. It looks like Obama's change of heart on gay marriage has upset some of his base. The link is to a video about the church sign. How's this for a trade: 6,500 manufacturing jobs and an investment of more than $4 billion in exchange for the right to sell cars in a particular state. That's one of the intriguing story lines surrounding the decision of where Tesla Motors will locate a massive Gigafactory for producing lithium-ion batteries and electric storage applications. Texas is one of four states named as a finalist for the massive plant, along with Arizona, Nevada, and New Mexico. So why is Texas such an intriguing candidate? It all stems from the contentious relationship Texas lawmakers have had with Tesla in keeping the electric car maker from selling cars in that state. Until now, there has been little reason to believe Texas' ban on direct auto sales would be lifted, but the Gigafactory could change that assumption. The Tesla Gigafactory, wherever it's located, will provide a huge boost to the local and state economies. You can see more on these statistics here. Obama's job performance has been a disaster and if the private sector energy business that is keeping this economy afloat and yet he is still blocking drilling on most federal sites. The health insurance industry fighting proposed cuts to Medicare Advantage payments argued they will raise seniors' out-of-pocket costs next year. America's Health Insurance Plans (AHIP), a trade group, blasted the reductions with a report Thursday finding that beneficiaries could pay as much as $900 more in 2015 if the cuts take effect. The report by consulting firm Oliver Wyman concluded that Medicare Advantage (MA) plans could see a 5.9 percent total cut to their payments next year as a result of changes proposed by federal health officials. The Centers for Medicare and Medicaid Services (CMS) floated a 2015 cut of roughly 2 percent on Friday. The number was less than many insurers expected, causing major gains for several insurance stocks this week. Still, AHIP President Karen Ignagni said the CMS is putting seniors' well-being on the line. An FBI mole who provided valuable intelligence on al Qaeda and met with Osama bin Laden was lured away from the FBI to work for the CIA, but was killed by al Qaeda operatives in Bosnia who suspected he was an informant, NBC News has learned exclusively. The informant, a Sudan-born driver and confidante to “Blind Sheikh” Omar Abdel-Rahman, the radical Muslim cleric who allegedly masterminded the first attempt to take down the World Trade Center, had been the sole human asset providing first-person information about al Qaeda in the mid-1990s as the terror group gained strength around the globe. According to sources familiar with the management of the mole, the FBI recruited him in 1993 because he was a known associate of the Blind Sheikh. The Obama administration says that we need to end what it calls “the era of austerity” in Washington. Notably excluded from this admonition is the one department of government that is actually experiencing austerity worthy of the name. Defense Secretary Chuck Hagel unveiled a military budget that will reduce the US Army to pre-World War II levels. The spin is that this will be a smarter force better suited to 21st-century challenges, but everyone knows that it is all about accommodating the trillion dollars in defense cuts adopted during the recent Beltway budgetary wars. ... There is more. The contrast in the austerity for our national defense and spending on liberal policies is stark. It is what has made Europe weaker and poorer and it is what Obama and Democrats want for the US. Last year, CBS News correspondent Armen Keteyian interviewed a Chicago drug trafficker who worked closely with Joaquin "El Chapo" Guzman's Sinaloa cartel. The man, who we will call "Señor X," knows the methods, operations, and cruelty of the Sinaloa cartel, first hand. Only part of Keteyian's interview with Señor X was aired on 48 Hours "War in Chicago" program in May 2013. Señor X had more to say about the Sinaloa cartel. According to Señor X, "In California, Chicago, (Sinaloa) is very strong... they know Chicago well. They know it's a good market for drugs. The people that they have here, they have a lot of trust in them. And they're a part of the organization.... The heroin is coming to Chicago, they're transporting it in small quantities... five, seven kilos." The 'smoking gun' in the targeting of conservative groups has been hiding in plain sight. Smith provides a detail list of events with many of them pointed toward the President and Democrat Senators. Shocking. Why have they hidden their light under a bushel for all these years? Senate Majority Leader Harry Reid on Tuesday delayed action on legislation raising the minimum wage, the centerpiece of the Democrats’ 2014 agenda. [snip] Reid has not yet unified his caucus on the issue, which is a constant in the Democrats’ election-year playbook. Of the 55 senators who caucus with the Democrats, only 32 have signed on as official co-sponsors of Sen. Tom Harkin’s (D-Iowa) bill. The dawn raid in Crimea came a day after Russian President Vladimir Putin ordered snap combat readiness drills to be held near the Ukrainian border, raising fears the Kremlin might use force to sway the outcome of a three-month crisis that has pitted Moscow against the West in a Cold War-style confrontation. It is an interesting study that contradicts some of what the anti energy left has been arguing about their usage. If they can reduce the damage caused by the storms, they may actually help pay forthemselves and provide some electricity. The Keystone XL southern leg has delivered its first barrels of Canadian oil to the Texas coast, even though the project still lacks its planned northern leg into Canada, TransCanada CEO Russell Girling said in an interview Wednesday. The crude moved through TransCanada’s existing pipelines, including the original Keystone pipeline that began operation in 2010. The oil then made its way from Cushing, Okla., to Nederland, Texas, on the recently completed $2.3 billion southern portion of Keystone XL, also called the Gulf Coast Project, he said. It arrived at the end of the line last week. TransCanada began moving oil into the pipeline on Jan. 2 and made its first deliveries to refiners on Jan. 22. The Obama administration’s Interior Department is on track this week to release a final environmental analysis that would help pave the way for the first seismic studies in decades to pinpoint oil and gas off the East Coast, as well as potential drilling in the 2020s. But marine scientists, conservationists and some lawmakers are pushing back against the environmental study even before its expected Friday release, saying the analysis is fundamentally flawed — and legally vulnerable — if the Interior Department doesn’t wait for a separate federal agency to finalize new guidelines on how much sound marine mammals can tolerate. Going forward without considering the acoustic guidelines still being developed by the National Marine Fisheries Service could mean underestimating the auditory injuries to dolphins, whales and other sea life from the blasts of compressed air used in the seismic studies, 102 scientists and biologists said in a letter to President Barack Obama. Events in Ukraine are accelerating fast. On Wednesday, there were skirmishes in Crimea between pro-Russian demonstrators and Muslim Tartars. Over in Moscow, meanwhile, Vladimir Putin, ordered his military to conduct exercises in Russia's western district, a region which – coincidentally or not – borders Ukraine. The rhetoric has grown more heated, too. Russian officials have claimed the rights of Russians in Ukraine are being severely infringed. Foreign minister Sergei Lavrov has dismissed opposition protesters in Kiev who turfed out president Viktor Yanukovych as ultra-nationalists and "pogromists". Prime minister Dmitry Medvedev has said Ukraine's new rulers are not legitimate. As military faces cuts, Obama wants $300 billion for roads and railways He is also pushing the military to waste money on alternative energy projects and boondoggles. He is weakening the military and wasting money on big government spending. MILTON Friedman once said that, if you put the government in charge of the Sahara desert, there’ll eventually be a shortage of sand. No wonder that, after 14 years of socialist government, Venezuela – the country with the world’s largest oil reserves – is currently importing gasoline. This fact highlights Venezuela’s painful descent into chaos, as the economy crumbles and the nation’s social fabric unravels. Venezuela is now witnessing its largest protests in a decade. The government of President Nicolas Maduro has cracked down on demonstrations with unprecedented force, using the National Guard and armed paramilitary gangs. At least 14 people have been killed, with hundreds detained – including Leopoldo López, one of the most emblematic leaders of the opposition – and over a dozen cases of torture reported. Diana Furchtgott-Roth: The economy is stumbling along at 2 percent annual GDP growth and employment growth continues to disappoint. One bright spot is energy, which is booming despite government obstacles. With more efficient regulation America could increase energy production, and next week Senator Ted Cruz (R-TX) will release a bill to do just that. 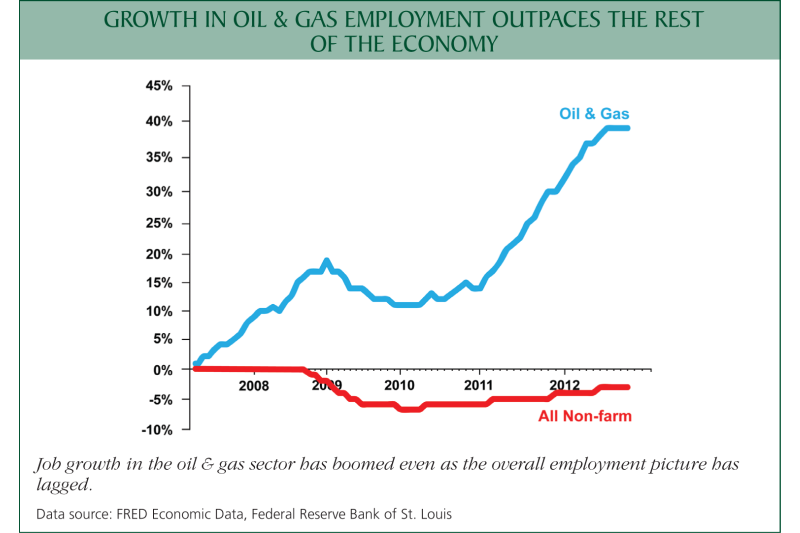 A soon-to-be-released report by my Manhattan Institute colleague Mark Mills shows that even though U.S. employment is still below prerecession levels, jobs in oil and gas industries have grown by 40 percent since 2007, the start of the recession. With oil and gas adding $300 billion to $400 billion every year to the economy, Mills suggests that the United States might still be in a recession if not for oil and gas. So is Harry Reid going to call all of these victims of his legislation liars even though it was Obama 's false statements that were used to sell the mess? Using the food stamps to get cash from ATM's in pot shops is going to be an issue. They are not allowed to use the cards at liquor stores, but pot shops are OK? Why the US Army is spending billions on clean energy While the article seems to think these boondoggles are a good idea, I find them appalling. There is probably a place for solar and wind energy on remote bases where we can avoid exposing fuel convoys to enemy attacks, but large scale alternative energy projects for large US bases are a colossal waste of money on inefficient energy. If we are cutting troops strength to engage in this folly that is a mistake that could lead to a lot of people getting killed. The Republican Governors' Association ad hits Democrat governors' record. In a revelation missing from the official investigations of the Sept. 11, 2001, terrorist attacks, the FBI placed a human source in direct contact with Osama bin Laden in 1993 and ascertained that the al Qaeda leader was looking to finance terrorist attacks in the United States, according to court testimony in a little-noticed employment dispute case. The information the FBI gleaned back then was so specific that it helped thwart a terrorist plot against a Masonic lodge in Los Angeles, the court records reviewed by The Washington Times show. “It was the only source I know in the bureau where we had a source right in al Qaeda, directly involved,” Edward J. Curran, a former top official in the FBI’s Los Angeles office, told the court in support of a discrimination lawsuit filed against the bureau by his former agent Bassem Youssef. Why is Russia putting troops near Ukraine on alert? Russian troops near Ukraine put on high alert As Ukraine disbands the security force that spearheaded most of the attacks on protesters in Kiev, neighboring Russia has launched surprise military exercises to test the readiness of its forces. Ukraine is not a threat to invade Russia, but the reverse is a possibility, and this administration needs to make sure the Russians understand that such an invasion would not go unchallenged. Protesters are using a variety of homemade weapons against troops, including miniature Molotov cocktails and Miguelitos made from hoses festooned with nails. During the Samurai period in Japan only those chosen by the government were allowed to have swords. Those restrictions led to the innovations in weapons that show up in the martial arts films today. People find creative ways to defend themselves when the government becomes an oppressor. The welder and the blacksmith become weapons manufacturers. Israeli warplanes have reportedly hit a convoy on the Syria-Lebanon border carrying anti-aircraft missiles from war-torn Syria to Hezbollah, amid growing Israeli concerns about a threat to its northern border. But the most immediate threat the Israelis perceive from that quarter is not Iranian-backed Hezbollah. The Lebanese Shiite group has committed thousands of its troops to support the embattled Damascus regime, a key ally of Iran, and is unlikely at this time to want to open another front against the Jewish state, its traditional enemy. The biggest danger the Israelis see right now is the growing number of Sunni jihadist fighters linked to al-Qaida who have become the main rebel force battling to topple the regime of President Bashar Assad. Someone wanted the records to disappear without a trace under the gray waves of the Kyiv Reservoir. Instead, they are ending up on the Internet for everyone in the world to see. When ousted Ukrainian president Viktor Yanukovych and his entourage were fleeing the lavish presidential residence at Mezhyhirya, outside of Kyiv, on the night of February 21-22, they dumped hundreds of documents into the reservoir in an amateurish attempt to conceal the information they contain. But journalists and scuba divers showed up on the scene just hours later and began recovering the soggy papers. Some were floating surreally along the edges of the water; others were recovered in stuffed file folders from the depths. For the last three days, a group of journalists and criminal investigators from the post-Yanukovych government has been working to dry out the papers and the first 500 have now been photographed and placed on a special websiteYanukovychleaks.org for all to see. Even a casual glance at the headlines from Ukraine and Venezuelawould indicate that the world is still a dangerous place and may turn even more dangerous in the future. Though President Obama no longer is heard to say that "the tide of war is receding" -- a favorite phrase from his first-term speeches -- his administration still holds an unrealistic view of how to keep the U.S. safe amid those dangers. That unrealistic view is what's guiding the Pentagon's plan for dramatic cuts in U.S. military forces. The favored buzzword is "risk," as in "more of it." That's been a defining characteristic of Obama's defense strategy for more than two years, ever since he decided to slash $500 billion fromPentagon spending to protect entitlements and other Democratic sacred cows in the federalbudget. Gov. Perry reflects on what Obama told the governors this year. Irked at the gall of Republicans in using the Democrats' votes for health care against them, liberals have discovered a plot that is even more sinister: the GOP is using "anecdotes" (i.e., the stories of people who have been hurt by the measure) in an effort to take the Left down. By "anecdotes" they mean stories like the those of Edie Littlefield Sundby, the stage-four cancer patient who can't keep her old team of physicians; the parents who can't take children to the hospitals at which they were formerly treated; the people having trouble paying their premiums; or the story related in the Wall Street Journal on Monday by Stephen Blackwood, whose mother, also suffering from a rare form of cancer, can no longer get access to the medicines that have kept her alive. Growing production of U.S. oil and gas is helping to improve the nation’s trade balance, according to a federal report Monday. Dramatic growth in the export of refined petroleum products, such as jet fuel and gasoline, has led the way. The value of net refined exports increased 55 percent in 2013 over the prior year, reaching $33 billion, according to the U.S. Energy Information Administration. U.S. refiners are finding cheaper domestic alternatives to overseas oil, causing a rally in the ratio of refined fuel exports to imports. Overall energy export values increased 8 percent in 2013 over the prior year. Total energy imports to the U.S. fell by 11 percent for the same time period. Gunmen from Islamist group Boko Haram shot or burned to death 59 pupils in a boarding school in north-east Nigeria overnight, a hospital official and security forces said on Tuesday. "Some of the students' bodies were burned to ashes," police commissioner Sanusi Rufai said of the attack on the federal government college of Buni Yadi, a secondary school in Yobe state, near the state's capital city of Damaturu. Bala Ajiya, an official at the Specialist Hospital Damaturu, said the death toll had risen to 59. "Fresh bodies have been brought in. More bodies were discovered in the bush after the students who had escaped with bullet wounds died from their injuries," he said. Rufai, who had given an earlier estimate of 29 killed, said all those killed were boys. He said the school's 24 buildings, including staff quarters, were completely burned to the ground. Small business will see its profits squeezed and will probably have to reduce employees. It is another attack on small business that this administration seems to be at war with. California Couple Finds $10M in Gold Coins Buried in Yard The coins appear to be issued between 1847 and 1884 and uncirculated. There were 1,427 coins in the buried treasure. Pakistan on verge of operation targeting Taliban The government is planning to launch a major military offensive in the North Waziristan tribal region following a series of brutal attacks in recent weeks, according to a senior Pakistani official. Pakistan has a history of not pushing these attacks more than a few weeks before agreeing to some kind of truce that allows the Taliban to survive and withdraw their troops. This time they are using aircraft more than army units but that is basically a raiding strategy that does not control space for more than the trasitory mintes the planes are over their target. U.S. Sen. Kay Hagan, who has been under fire from conservatives over the federal health care law, refused on Monday to answer questions about what she knew about the laws limits. Like President Barack Obama, Hagan said the Affordable Care Act would allow North Carolinians to keep their existing insurance plans if they liked them. The pledge proved false – and earned Obama PolitiFact’s Lie of the Year honors. But the details about what Hagan knew about the law’s limits and when she learned itremains unclear. Asked about it again Monday at a press conference in Raleigh, after she made her re-election bid official at the State Board of Elections, Hagan avoided the question. A new study reveals that nearly 33,000 jobs have been impacted due to the Affordable Care Act’s medical device excise tax. The report comes from the Advanced Medical Technology Association following an online survey of member companies last year. Stephen J. Ubl, CEO of AdvaMed, said this tax needs to be repealed. Although upsets are unlikely, the long list of candidates trying to unseat high-ranking Republicans in the primaries reflects fissures within the party. There is real resistance to accommodating liberalism on the right. Leaders who feel pressure from the media to compromise are having to defend those compromises in primary elections this year. It is hard to get a feel for how effective those challenges are in the House races, but the Katrina Pierson challenge to Congressman Sessions in the Dallas area has attracted some attention and has gotten an endorsement from Sarah Palin. Polling has shown Sen. Cornyn with a substantial lead over his challengers. Both sides need to do a better job of explaining what there strategy is in dealing with a liberal President and a liberal media. Anti-government protesters in Venezuela have erected barricades in the capital, Caracas. They placed burning rubbish and furniture on main roads in an attempt to bar access to the city. Opposition leader Henrique Capriles had earlier asked his supporters not to follow a call for a "national blockade" circulated on social media. The blockades are the latest in a series of opposition protests in which 13 people have died. There have been reports of similar blockades in the cities of Maracaibo and Valencia. Protesters also banged pots and pans in the early hours of the morning to show their opposition to the government of President Nicolas Maduro. They say they will continue with their wave of protests, which started more than two weeks ago, until Mr Maduro resigns. ... Food is certainly an element of the discontent in Venezuela. The attempts to control supply and prices with a heavy handed top down management have been disastrous. Maduro is even more incompetent than Chavez. Leukemia patient Julie Boonstra is the latest American to get caught up in the media fact-checking frenzy. Her offense: Appearing in an anti-Obamacare ad for Americans for Prosperity, in which she said her out-of-pocket costs had become "unaffordable" since her insurance was canceled because of President Obama's health care law. She also said Rep. Gary Peters, D-Mich., who is running for Senate, "jeopardized my health" by voting for it. Within hours of the AFP ad's initial broadcast, media fact-checkers pored over alleged inconsistencies between her comments in the ad and statements she'd made in interviews, then said her numbers didn't add up. Liberal pundits suggested they knew what was good for her better than she did. Peters sent a letter to television stations running the ad threatening their licenses if the "questionable claims" in the ad were not proven. The lighter, faster surface fleet of the future may get heavier than Navy leaders have planned, as high-ranking skeptics at the Pentagon try to convince lawmakers that the service is relying too much on a new coastal warfare ship. At the beginning of the year, the Navy was headed toward three decades of more speed in coastal areas and less slug-it-out strength on the high seas. By 2026, about one in six active-duty vessels would be a littoral combat ship, a light hull that can move upward of 50 mph, but one that carries less armament in comparison with some of the ships it would replace. However, a disagreement within the Pentagon has made the scope of the LCS program uncertain, despite there being no clear replacement for a big chunk of the future fleet. It's happening in Ukraine, Venezuela, Thailand, Bosnia, Syria, and beyond. Revolutions, unrest, and riots are sweeping the globe. The near-simultaneous eruption of violent protest can seem random and chaotic; inevitable symptoms of an unstable world. But there's at least one common thread between the disparate nations, cultures, and people in conflict, one element that has demonstrably proven to make these uprisings more likely: high global food prices.